In a year where singles trump albums, Jamestown Revival is here to remind us that a 12 song record can still keep your full attention – and that the South is alive and well in Americana. 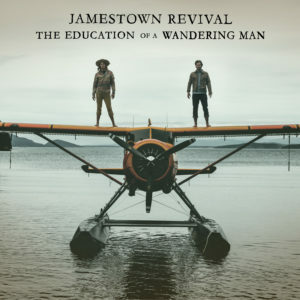 Austin, TX duo Jamestown Revival (Jonathan Clay & Zach Chance) – in true country style – ditched the traditional studio setting to record their new release, The Education of A Wandering Man (out October 7), for a farmhouse. The setting couldn’t be more perfect. Streaming through the grit of this record, it would have been disappointing to think of the studio sessions happening inside of a cold, dark booth. The essence of the album is found within the extremely raw craftsmanship of each song, demanding you to listen and daring you not to yell along to the choruses. This kind of energy can’t be contained inside a corporate enclosure – it can’t be confined to the definitions we set for genre. Opener Company Man takes a refreshing politically charged stance against corporate greed that hits close to home for Jonathan, whose family’s land was targeted for pipelines under a protection of public domain. “That piece of land is sacred to us, but ironically, nobody else cared about it until there was something to gain.” This notion that you can’t strip a person of their life, whether it is land or bad habits, follows the record from this first track to the last. The album continues on, weaving between bits of Motown and Alt-Country, harmonies of bright guitars bringing the southern roots to the forefront.“The songs on this album are nothing more than a group of friends playing music in a living room,” the band said, and if you listen to tracks like American Dream and Always Been Wild, the truth of that statement can be heard loud and clear. Poor Man’s Gold could easily be a breakthrough along the lines of The Black Keys and lead single Love Is A Burden has all the right chords to breach that mainstream surface. The album stays true to its title, taking the listener on a journey both figuratively with tracks like Back To Austin and metaphorically, detailing the intangibility of love when you’re constantly on the move. The Education Of A Wandering Man is a strong second album from the duo, giving old fans exactly what they have been waiting for while also exceeding the high expectations for songwriting that a hit like California (Cast Iron Soul) has set as a precedent for the group. Listen to this record in order from beginning to end – the tracklist plays like a story you never want to end. You can catch Jamestown Revival on tour through November.